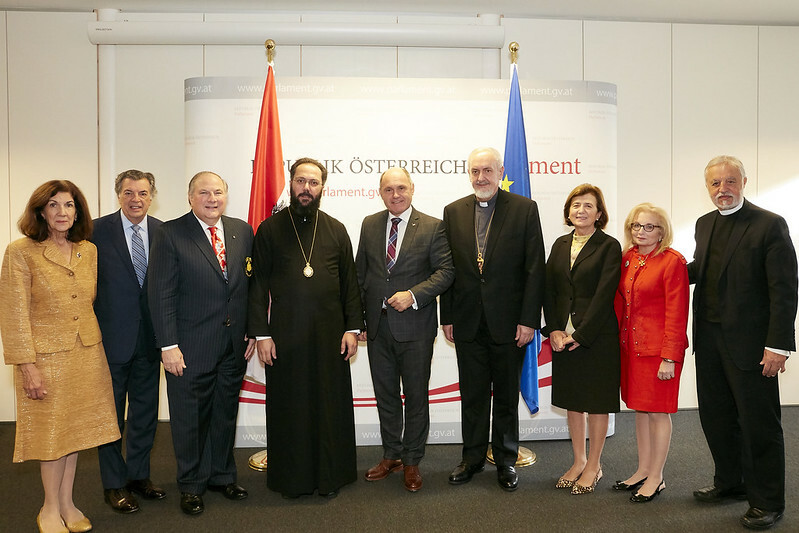 With the blessings of His All-Holiness Ecumenical Patriarch Bartholomew and His Eminence Archbishop Demetrios, Geron of America, a delegation of the Order of Saint Andrew the Apostle, in a continuation of the Archons’ Religious Freedom Mission, visited Vienna, Austria, the current seat of the European Union Presidency; and Budapest, Hungary, from November 3 to November 10, 2018. The Order’s delegation was comprised of National Commander Dr. Anthony J. Limberakis, National Secretary Hon. B. Theodore Bozonelis and Spiritual Advisor Fr. Alexander Karloutsos, who were all accompanied by their wives, Dr. Maria A. Limberakis, A. Helen Bozonelis and Presbytera Xanthi Karloutsos. Joining and leading the delegation were His Eminence Metropolitan Emmanuel of France and His Eminence Metropolitan Arsenios of Austria and Exarch of Hungary and Central Europe. They planned and coordinated an intensive schedule that included 14 separate meetings with religious leaders, heads of state, and diplomats. The delegation focused on the message of advocating religious freedom for the Ecumenical Patriarchate in Turkey and Orthodox Christians worldwide, human rights, and the right of self-determination for the Ukrainian Orthodox Church in the grant of autocephalous status by His All-Holiness Ecumenical Patriarch Bartholomew. In this regard, it was most propitious that Metropolitan Emmanuel led the delegation, as he chairs the Patriarchal Committee on Autocephaly for the Orthodox Church in Ukraine, having represented His All-Holiness in Moscow, Kiev and at the 14 Autocephalous Orthodox Christian Churches. 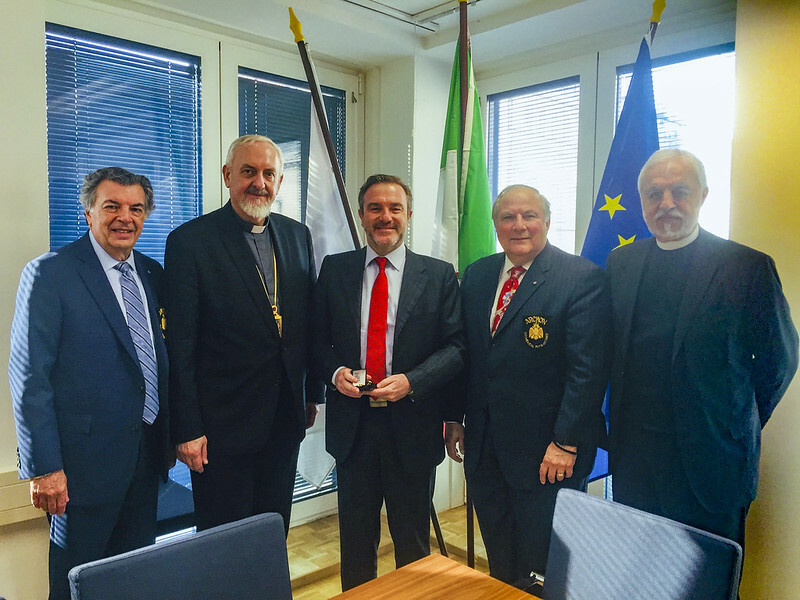 Archon delegation with Metropolitan Arsensio meets with His Excellency Catholic Bishop Agidius J. Zsifkovics of Eisenstadt. The Order began its Religious Freedom Mission upon arrival in Vienna. His Eminence Metropolitan Arsenios hosted a welcoming reception for the delegation at the historic Metropolis of Austria followed by a meeting with His Excellency Catholic Bishop Agidius J. Zsifkovics of Eisenstadt. Issues discussed at the meeting included the venerable history of the Orthodox Christian Church in Austria; and the mutual cooperation, respect and assistance between the Orthodox Christian and Catholic Churches in Austria, including land grants to the Metropolis of Austria by the Catholic Church. The delegation sought spiritual guidance at and attended a concert in the Metropolis’ beautiful Holy Trinity Cathedral and visited the Chapel of Saint John Chrysostom in Vienna’s historic Greichenviertel (Greek Quarter). The Greek Quarter also houses some of Austria’s oldest buildings including the site where the world’s first newspaper in Greek was published and where Greek revolutionary leaders met to plan for the War of Independence in 1821. Archon delegation celebrated Divine Liturgy in the town of Traiskirchen. The following day, on Sunday November 4, 2018, the delegation led by Metropolitan Arsenios attended Divine Liturgy and participated in a procession of Icons at the recently founded Orthodox Christian Church in the town of Traiskirchen to the south of Vienna, where the Liturgy was chanted in the vernacular, German. This was followed by a luncheon where the Order offered a donation to the Parish to assist in its ministry. During the week, Metropolitan Arsenios led the delegation on a journey to Budapest, Hungary to visit the Exarchate of Hungary of the Ecumenical Patriarchate and the new building donated by the Hungarian government that will become the centre of the Exarchate in Hungary. While in Hungary. Metropolitan Arsenios also led the delegation to the village of Szigetszententmiklos (St. Nikolaus Island) on the Danube River, south of Budapest, to visit a newly renovated Orthodox Christian parish. It was purchased in a residential area where the volunteer Priest whose lay profession is a teacher of Information Technology, Father Robert Szentirmai, built the Iconostasios by hand, as he is a master woodcarver. The Order, inspired by his dedication and the visionary leadership very apparent in the Metropolis, offered a donation to Metropolitan Arsenios to complete the purchase of the church edifice, a converted home. National Commander Limberakis speaking with Chancellor of Austria, Sebastian Kurz. With Austria holding the current rotating presidency of the European Union, the delegation, with the important assistance of Metropolitan Arsenios and Metropolitan Emmanuel, was privileged to meet with the heads of state of Austria. Discussions focused on the religious freedom issues for the Ecumenical Patriarchate in Turkey, persecution of Christians worldwide, and human rights for all faiths. Archon delegation meets with Chancellor of Austria, Sebastian Kurz. Most important, the delegation was honored to meet with the Chancellor of Austria, Sebastian Kurz, the head of state. The Chancellor is 32 years old and the youngest head of state in Europe. His political party and political views are Christian-democratic and conservative. He has combated radical Islam and ended the foreign state funding of mosques and imams’ salaries in Austria. With the presidency of the European Union, the Chancellor has championed security and the fight against illegal immigration as a central issue. In discussions with the delegation, the Chancellor fully supports the Order’s religious freedom issues on behalf of the Ecumenical Patriarchate and has a close working relationship and respect for Metropolitan Arsenios. Archon delegation meets with First President of the Austrian Parliament, Mag. Wolfgang Sobotka. The delegation also met with the First President of the Austrian Parliament, Mag. Wolfgang Sobotka. His position is similar to the Speaker of the House in the U.S. Congress. He is the presiding officer of Austria’s National Council. The meeting was held as an official visit with the Austrian government attended by various government officials and staff which indicated the respect for the Order’s issues and the high priority that the Austrian government places on religious freedom. The First President expressed an understanding of the restrictions on the religious freedom, the lack of legal status for the Ecumenical Patriarchate, and the need for the European Union to be vigilant. A subsequent meeting was also held with the Third President of the Austrian Parliament, Anneliese Kitzmuller, who also indicated her political party’s strong support for religious freedom and the need to both counter the persecution of Christians and protect the Christian faith. Archon delegation with Honorable Trevor D. Traina, bilateral Ambassador of the United States to Austria. In Vienna, the delegation met with the Honorable Trevor D. Traina, bilateral Ambassador of the United States to Austria. The delegation advocated for the strong support of the United States as to the religious freedom issues faced by the Ecumenical Patriarchate in Turkey, persecution of Christians worldwide, and the canonical and political significance of granting autocephalous status for the Ukrainian Orthodox Church. Ambassador Traina was knowledgeable and receptive to the Order’s concerns. Two additional and separate meetings followed on these issues with Her Excellency Elena Rafti, Ambassador of the Republic of Cyprus in Austria and with His Excellency Nikolaos Sapountzis, Charge d’ Affaires a.i.,of the Hellenic Republic in Austria. Archon delegation meets Secretary General Thomas Greminger of the OSCE. The OSCE is an important component of the multifaceted international religious freedom initiatives of the Order, as each year the Order sends a delegation to the OSCE annual human rights meetings held in Warsaw, Poland. The OSCE is headquartered in Vienna and the Order had significant meetings with the current holder of the OSCE Presidency (Italy), the incoming OSCE Presidency beginning in January (Slovakia) and the Secretary General of the entire OSCE. Consonant with our mission, the Order concentrated its efforts to promote human rights and religious freedom for the Ecumenical Patriarchate and all Orthodox Christians in six separate meetings during the week. The mission of the OSCE is to work for stability, peace and democracy among the 57 participating countries. The meetings emphasized the importance of the recognition of the systematic persecution of Christians in Turkey, and the understanding of the grant of autocephalous status for the Ukrainian Orthodox Church. Archon delegation holds meetings with OSCE in Europe. Above, meetin with Ambassador Alessandro Azzoni (Italy), Chairperson of the OSCE Permanent Council. Meetings were held with the Honorable Harry Kamian, Charge d’ Affaires a.i., to the U.S. Mission to the OSCE; Ambassador Alessandro Azzoni (Italy), Chairperson of the OSCE Permanent Council; Ambassador Bohac, Permanent Representative of the Slovak Republic to the OSCE; Ambassador Alexis Zannos, Greek Permanent Mission to the OSCE; Ambassador Ioannis Vrailas, Permanent Representative of the European Union to the OSCE; and an overall analysis and final meeting with Secretary General Thomas Greminger of the OSCE. Encouraged by Ambassador Bohac, the delegation also travelled to nearby Bratislava, the capital of Slovakia, along the Danube River and there had an impromptu visit with the Counsel of the Embassy of Greece in Slovakia. National Commander Limberakis with His Excellency Fahad Abualnasar, Director General of the KAICIID Dialogue Centre (King Abdullah bin Abdulaziz International Centre for Interreligious and Intercultural Dialogue). The delegation also had a meeting and luncheon with His Excellency Fahad Abualnasar, Director General of the KAICIID Dialogue Centre (King Abdullah bin Abdulaziz International Centre for Interreligious and Intercultural Dialogue) in Vienna to discuss cooperation, respect and understanding among Muslims and Christians, and all faiths. The Centre promotes interreligious and intercultural dialogue. Metropolitan Emmanuel is a member of the Board of Directors as the representative of our Orthodox Christian faith. At the meeting a poignant exchange took place regarding the unique concerns of Muslim women in the United States in the context of medical care with Director General Abualnasar and Dr. Maria Limberakis, a primary care physician. The Archon delegation visited the recently founded Orthodox church parish of the Metropolis of Austria in the town of Traiskirchen to the South of Vienna. Leaving the comfort of our homes and safety in the United States and traveling half way around the world to meet in personwith these religious and government leaders, diplomats, and organizations was and continues to be the most effective form of communication and the transmission of our message. It allowed a meaningful dialogue to advocate for the protection and preservation of the Ecumenical Patriarchate. The mission of the Order of Saint Andrew the Apostle requires no less, and the delegation was honored to accept this responsibility on behalf of the Order.